No, I can't believe it either - two blog posts in ONE WEEK! Just like the old days! And don't be mislead by the title - this isn't about fallen leaves and gloriously hued trees - though there is much evidence of fallen leaves to be fair. It's about the colourful things in the cottage and garden which are still providing me with pleasure as the season gets a little murkier. In the header photograph you can see my favourite cardigan - and no, I didn't knit it, don't be silly! But I DID crochet the little bag which tones so well with it. This is Lucy's (Attic 24) Weekend Bag and I chose the Heatwave colour scheme specifically to go with the cardigan. It's made using chunky wool and worked up in absolutely no time at all. A real joy to crochet. 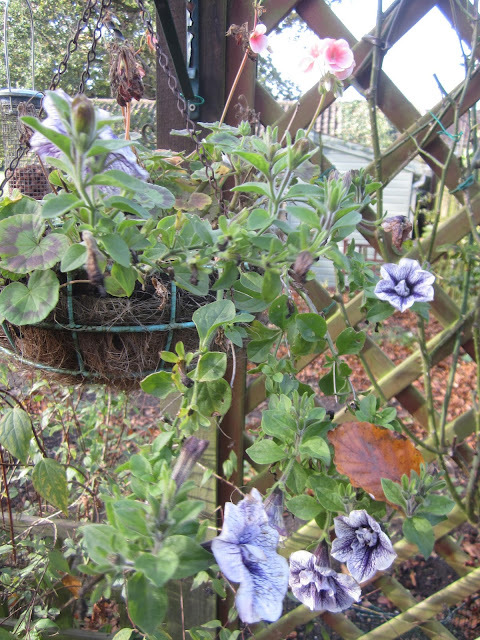 Off out into the garden, and - aside from the profusion of fallen leaves still littering the place despite Jim's hard work with the leaf blower - there are still so many flowers hanging on in there long after they should be gone. A real delight, especially the fuchsias. I was amazed to discover that last hollyhock, hiding behind the bins! And it hasn't been long since the rose decided to call it a day. 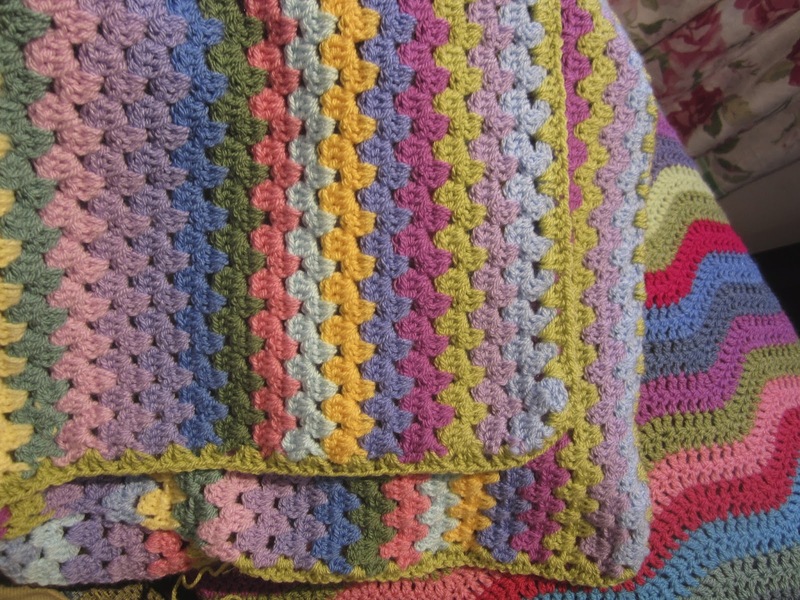 And speaking of crochet, HOW long have I had this granny stripe on the back-burner? The actual blanket was finished ages ago, but the ends needed darning in and the border put on. I finally sat and did the darning over the weekend, while the rugby was on, and began the pistachio border, but have run out of wool and am waiting for a delivery. Behind it over the back of the chair is one of my ripple blankets, also an Attic 25 pattern. She gives such full and clear instructions and detailed photographs of every stage, just what I need! It has been very soothing trebling along round the border, and I have another two rows to go - bliss! Some more gorgeous colour which delights me each time I go into the kitchen. On my lovely trolley I keep some of my favourite ceramic bits and pieces, my lemon/eggs/garlic storage and this fab food cover, isn't it pretty in pink? My blue and white salt pig we bought in Sienna many many years ago; the lid is cracked and repaired, and the rim has a few chips taken out of it, but I will never part with it. And how about these beauties! The spoon rest we found in Larners, up in Holt earlier this year, and the five small dishes I bought there also. When we were in Mallorca in September we found a shop selling the same patterned ware as the spoon, so we snapped up the three dipping bowls, and yes, we do use them for all sorts of things. (I have to say they were a lot cheaper in Mallorca than Holt, but you'd expect that!) It pleases my eyes immeasurably to glance at these items while I prep and cook. To my mind, colour gladdens the heart, and we could all do with a bit more of that these days! Toodle-pip, I won't promise to be as quick with the next post, but you never know! Colour is so important isn't it, it lifts the spirit on those dark and gloomy days - and no the sun has left us, it's turning a bit gloomy. I have a small collection of Spanish plates, sure you've seen them with their vibrant blues and yellows etc, it began with a small one a neighbour brought back from Spain as a thank you for taking care of their cat while they were away. (Sadly said cat died while they were away, nothing to do with me but I felt ever so guilty accepting a gift!) Anyhow, I loved the colours of the plate so much that whenever we were mooching round antique centres, I always kept a look out for more. And I have a thing about small bowls, fat bottomed jugs too. Ahhhhh such a happy cardigan Lynne !!! Have a good week Lynne ! Good Morning Lynne, It's a miracle! Two post in one week, I was delighted when I saw that you had posted again, Bravo! You have truly been making your crochet needles buzz. I love your bag, it's so pretty and cheerful. I agree we all can use a little more color. Those dipping bowls are brilliant . . . I am a fan of Spanish pottery, but don't see much of it around here. You must have a green thumb . . . so many flowers still in bloom. I picked a few last week and put in bottles in the kitchen window, but I think that will be the last of my flowers until next spring, when the tulips show their lovely faces. 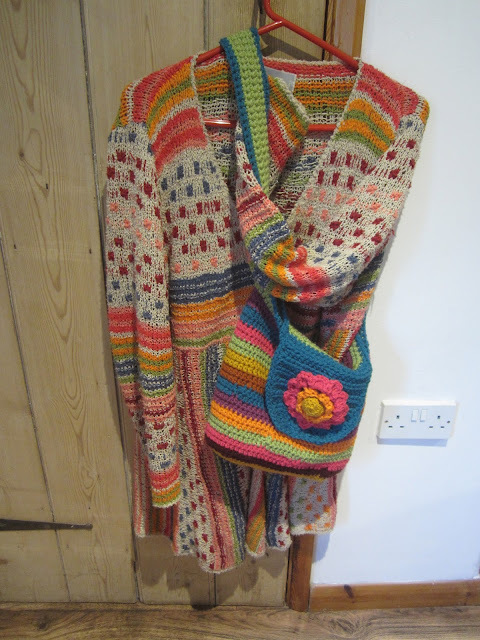 Beautiful cardi and bag. My kitchen doesn't have anything as cheerful asthose bowls, how pretty. Thanks Dc - but your gardens more than make up for it! I can still picture, especially, your gravel garden! Love the look of the flowers peeking thru falling leaves. It speaks of things to come.